Not up for cooking? No problem – we have just the recipe for you. No oven, hob or barbecue is needed for this 20 minute meal – minimum effort, maximum result. Put the couscous into a medium heatproof bowl, then pour over the 400ml boiling water. Briefly stir, then cover the bowl with a plate or cling film and set aside for 5-6 minutes until the couscous has absorbed all the water. Meanwhile, put the spinach in a large colander in the sink. Boil another kettle full of water, then pour it over the spinach to wilt it. Drain, pressing out as much liquid out as possible with the back of a large spoon. Combine the olive oil, lemon zest and juice, dijon mustard and garlic in a small bowl, then pour it over the couscous and fluff with a fork. Stir in the spring onions and dill, then transfer to a serving dish. 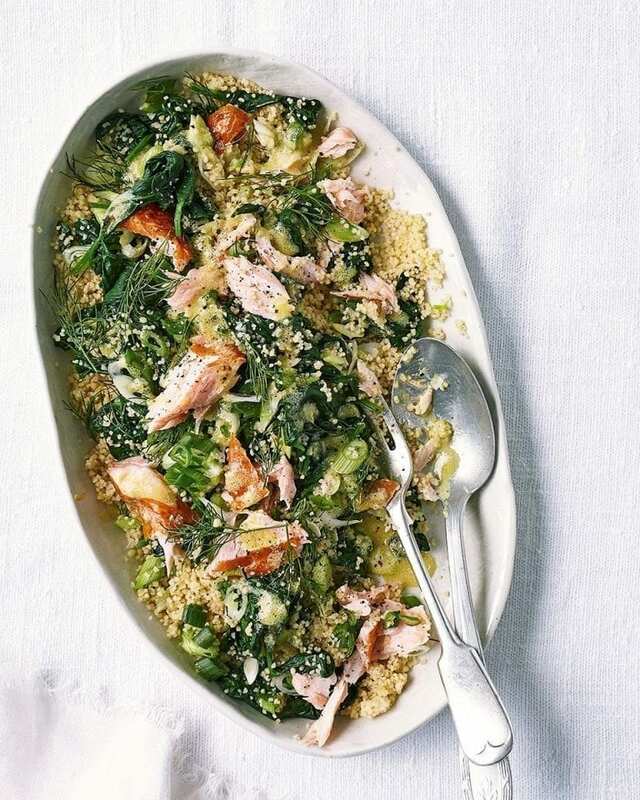 Flake the salmon into large pieces, then gently mix into the salad to serve.